Dreaming of summer staycations? Dream no more because the Hyatt Regency Scottsdale Resort & Spa has you covered with an amazing limited time summer offer. From now until April 28, 2017 book for some of the resorts lowest rates during June, July, and August. Nestled in the gorgeous Gainey Ranch neighborhood, surround yourself with 27-acres of rest and resort relaxation including spa, championship golf, tennis and 10 (yes you read that right, ten) pools. Set amidst flowering cactus and framed against the majestic McDowell Mountains, the Hyatt Regency Scottsdale Resort & Spa is just minutes from outdoor adventures and all the attractions of the vibrant Scottsdale area. While at the resort enjoy unique experiences like a romantic gondola ride along a seven-acre lake, a scale up the brand new 28 ft. rock climbing wall, or immerse yourself in the Native culture that surrounds the resort at the Native American Learning Center. Of course there’s no shortage of mouthwatering dining options. Indulge at one of several on-site eateries including SWB a southwest bistro featuring wood-fired delights, Noh serving a theatre of Japanese cuisine like succulent sushi and sashimi, Alto Ristorante e bar dishing up fresh and flavorful Italian eats. Or kick back with a cocktail at the scenic Center Stage Bar featuring lively musical entertainment nightly. 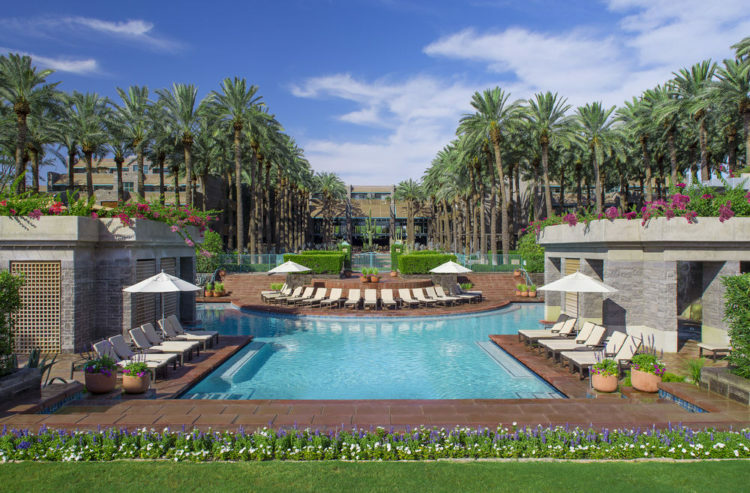 To book your sweet summer staycation visit scottsdale.regency.hyatt.com or call 800-55-HYATT, 480-444-1234. Discounted rates are only available from now until April 28 though so jump on this hot deal before it’s too late. The Hyatt Regency Scottsdale Resort & Spa is located at 7500 E Doubletree Ranch Rd, Scottsdale, AZ 85258.